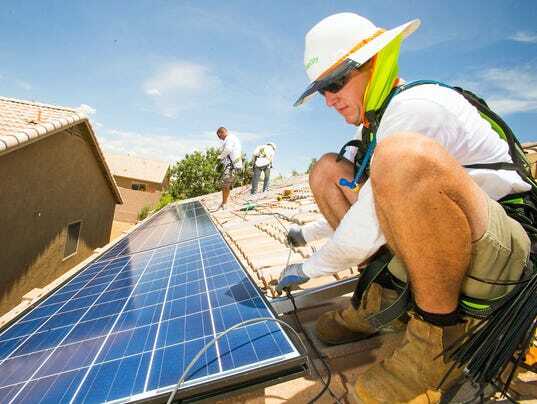 Arizona utility regulators voted Tuesday to end the system of net metering, where homeowners with solar panels get retail credits for power they send to the grid, and instead reduce the amount utilities pay homeowners for rooftop solar power. The five Arizona Corporation Commission members approved a judge's recommendation with some amendments after a full day of discourse and hours of public comments on Monday, mostly from solar advocates. The Corporation Commission began the proceeding in 2014, and hundreds of comments were filed, including those submitted by solar companies, mines, consumer advocates, utilities, merchant power plants and other groups with a stake in the decision. Commission Chairman Doug Little and Commissioners Bob Stump, Robert Burns, Tom Forese and Andy Tobin all seemed comfortable with changes to net metering, though they debated details of how to compensate homeowners for the power. The final vote was 4-1 with Burns opposed. "I think we’ve accomplished something pretty historic today," Little said during his vote. "While I will tell you that perhaps the decision we've come to today is not a perfect decision, it is definitely a step in the right direction." Through net metering, each kilowatt-hour from solar panels that goes to the grid is credited on monthly bills. The credits roll over month to month and offset the electricity that homeowners draw from the utility at night or when their panels are not making enough electricity to serve their needs. Because each kilowatt-hour of credit offsets a kilowatt-hour homeowners otherwise would purchase, it is worth the retail price of electricity, about 10 to 14 cents each, depending on a utility customer's rate plan. Administrative Law Judge Teena Jibilian recommended that utilities buy the energy for a price based on what they actually save in avoided costs of power plants, fuel and infrastructure. That will be substantially less than the retail price of electricity, officials agree. To prevent a shock to the industry, the regulators seemed to agree on a different calculation for rate cases that are pending, such as that for Arizona Public Service Co. Representatives from Vote Solar and the Alliance for Solar Choice estimated the changes would mean a 30 percent reduction in what utilities pay solar customers for their electricity, though some parties to the case disagreed with that figure. The pending rate cases will use a "resource comparison proxy" that will pay solar customers a rate based on what utilities are paying for solar energy from large solar power plants. Those wholesale rates are also below the retail rate solar customers get for their power today. The commissioners agreed they didn't want to reduce the payment more than 10 percent in a given year, though the initial drop-off from net metering to the new calculation could be more than that. Solar customers still will be able to use power from their panels on site, and avoid buying that energy from their utility. The savings they get from "self-consumption" isn't affected by the changes, only the compensation they get for sending excess power to the grid. The new compensation rates for excess solar power won't be used until those utilities go through a rate case. The decision also will not affect customers who already have installed solar, but will apply only to those who install it once the order takes effect at utilities under the purview of the Corporation Commission. 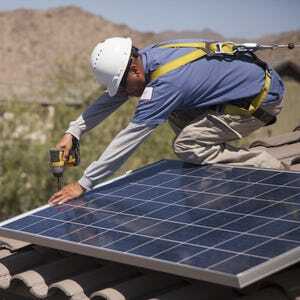 Commissioners agreed to the so-called "grandfathering" provision to preserve net metering for existing solar panels for 20 years from the date they were connected to the grid.